From a very wet and windy Herefordshire it's a welcome to the latest edition of "A carnival of green gardening". Not really gardening weather today, but, with cup of tea in hand, here's something to take your mind off the rain! New Old-Fashioned Gal presents What's eating my kale? posted at Diary of a New Old-Fashioned Gal, saying, "Ah the joys of organic patio farming!" Lizet Frijters presents A fun way to design your garden posted at Lizet Frijters. Louise Manning presents 9 facts about hedgehogs posted at Green Garden Chat. Jamie McIntosh presents Bad Hair Day posted at Suite101: Organic Gardens blog, saying, "All sorts of ingredients make for good compost." Jamie McIntosh presents Garden for your Best Life posted at Suite101: Organic Gardens blog, saying, "Working in the organic garden can nourish your body in more ways than one." That concludes this edition. Submit your blog article to the next edition of a carnival of green gardening using our carnival submission form. Past posts and future hosts can be found on our blog carnival index page. Earthworms (Lumbricus terrestris) (also known as lob worms or garden worms) are nature’s ploughs and are crucial for soil aeration. In an acre of land between 16,000-30,000 lbs (7,200-13,500kg) of soil passes through earthworms and is deposited on the surface each year. No wonder archaeologists are so good at digging! How do worms travel? No, not on the underground, but by using their complex muscle system and hairs, called setae. Earthworms do not have teeth, but use a gizzard to grind up pieces of food. Worms don’t have eyes (except in cartoons! ), but are sensitive to light. Earthworms don’t have lungs, but instead “breathe” through their skin as long as it stays moist. Earthworms are hermaphrodites ie their bodies contain both male and female reproductive organs. 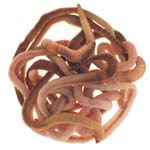 Not content with one heart, earthworms have no fewer than five. This week, it’s Part 2 of Heather’s Nuffield Scholarship trip to the USA and then she heads off to Canada with Farmer Phil and Monty. Her first stop is at the biodynamic vineyard owned and run by 24 members of the Benziger family on the slopes of the Sonoma Mountain. The next scheduled stop is at City Farmer in Vancouver where they teach urban agriculture and environmentalism and run a regional compost hotline that serves over 2 million people. Whilst Heather is talking beetles with the staff they are entertained by The Regal Trio playing a track from The Beatles. The last stop is at Geek Farm Life where they practice sustainable farming and add value to their own lives. Time: 00:00:18 Welcome! Richard's minding his own business, but it's still his fault and goats are smelly. Time: 00:21:08 And now to the folks at Geek Farm Life to the sound of turkeys and a head butting goat. As a follow up to yesterday’s post, "Rare breed pigs become rare breed pork", I found this old recipe, which is a traditional Cornish recipe and certainly dates from the days when every part of an animal would have been eaten. I love the names of these old recipes and this one is no exception – Muggety pie. Take the pig intestines and wash thoroughly. Cut them up and place in the bottom of a pie dish with the onions, salt and pepper. Cover the top of the pie dish with a pastry lid and bake for about an hour. Who’s brave enough to try it out and let us know what it tastes like? When we lived in Cornwall one of our neighbours was often to be found cooking tripe or chitterlings, the latter being entrails (normally pigs). I suspect there are probably lots of local dialect names for parts of pig (and other animals) and I would be interested to hear about them. In addition if anyone knows of any traditional recipes for pork it would be great to post these on the blog. The news this week is that the Wiggly porkers have now become oven sized joints. Heather and Farmer Phil decided that they would like to keep traditional pig breeds and originally purchased their two porkers from Home Farm in Gloucestershire, The Duchy of Cornwall’s organic enterprise. The team at Home Farm rear traditional breeds and Heather and Farmer Phil eventually chose a Tamworth pig and a Large Black pig. Rare breeds of pig are often overlooked in large commercial enterprises, but at Home Farm they are valued for the quality of their meat. The pigs spent a lovely time in their Herefordshire field, running over to the gate for fruity treats and proved a real hit at the Open Farm Sunday and Wiggly Days. When their “time was up” they were taken to Griffiths Slaughterhouse at Leintwardine, who are also award winning butchers (A H Griffiths) and famed for their sausages. The empty pig field looks like it has been ploughed and is strangely quiet. 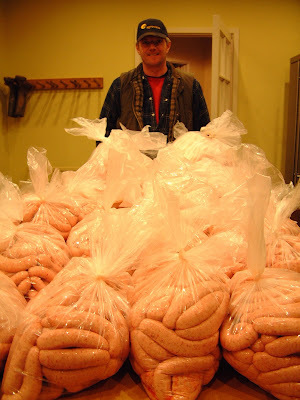 On the return of the pork, Farmer Phil set up a mini Farmers’ Market in the kitchen at Lower Blakemere Farm and over a couple of days staff were seen leaving with large bags of sausages and various joints (of the meat variety!). There has been much discussion at Wiggly Wigglers about the delicious tasting meat, proving, if proof were needed, that free range meat and outdoor reared meat have a far superior flavour.